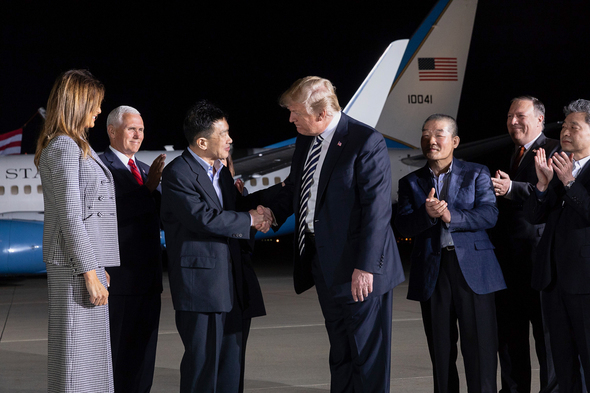 Vice President Mike Pence and Second Lady Karen Pence joined President Donald Trump and First Lady Melania Trump at Joint Base Andrews to welcome home three Americans who were held hostage in North Korea. "This is a proud and memorable moment for America," the Vice President said. Read the President's remarks from the arrival ceremony. Vice President Mike Pence last Monday spoke to the Organization of American States and called on the Maduro regime to suspend the upcoming sham elections and hold a real vote that gives the Venezuelan people the democratic choices they deserve. NEWS: Politico: "U.S. sanctions 3 Venezuelans, calls for election suspension." Vice President Pence addressed the NRA's annual meeting and promised that under President Trump, the American people's right to keep and bear arms shall not be infringed. On Thursday May 3, the Vice President delivered remarks in the Rose Garden and shared a Bible verse that has been hanging over his family's mantle for the last two decades: "For I know the plans I have for you, plans to prosper you, and not to harm you, plans to give you a hope and a future." Jeremiah 29:11. PHOTOS: See photos from the National Day of Prayer event. On Tuesday May 1, the Vice President joined Arizona Governor Doug Ducey at an event to highlight how the Trump Tax Cuts are already helping the hard working families of Arizona. FOX NEWS: "William Bennett: George Will scorns Pence for the high crime of decency"
"Conservative syndicated columnist George Will wrote this week that Vice President Mike Pence has “become America’s most repulsive public figure.” Why does Will think Pence deserves this absurd slur? Apparently, the columnist has found the vice president guilty of the heinous crime of being a decent man." MORE: Click here to read William Bennett's column. Vice President Mike Pence: "To be able to have an opportunity to visit with the detainees on the tarmac was deeply moving to Karen and me. To hear their expressions of support for President Trump, their gratitude to the Country and for the prayers of the American people, I'll remember the rest of my life." Click here to watch a clip of the CBS interview. On Good Morning America: "A real opportunity to achieve peace on the Korean Peninsula." Vice President Mike Pence: "President Trump changed the policies of the United States from an era of strategic patience to the kind of campaign that would bring economic and diplomatic pressure to bear. To see these three Americans come off the plane we hope is a sign this is a real opportunity to achieve peace on the Korean Peninsula." Click here to watch a clip of the NBC interview. Vice President Mike Pence: "We're continuing to look at policies and practices to make sure that not only are we protecting the unborn, but that we're protecting taxpayers who cherish the sanctity of life. And we'll continue to work earnestly on those issues in the days ahead." Click here to watch the full interview with EWTN. On CBN: "I'm pro-life and I don't apologize for it." Vice President Mike Pence: "I'm pro-life and I don't apologize for it. And I couldn't be more honored to serve shoulder-to-shoulder with the most pro-life President in my lifetime." Click here to watch the full interview with CBN.